TALLADEGA, Ala. (AP) — Tony Stewart hired Aric Almirola because he believed the journeyman would win races for Stewart-Haas Racing. Almirola came close time and again this year but fell short. The boss made sure to keep Almirola’s spirits high every chance he got, including a pre-race pep talk Sunday at Talladega Superspeedway. 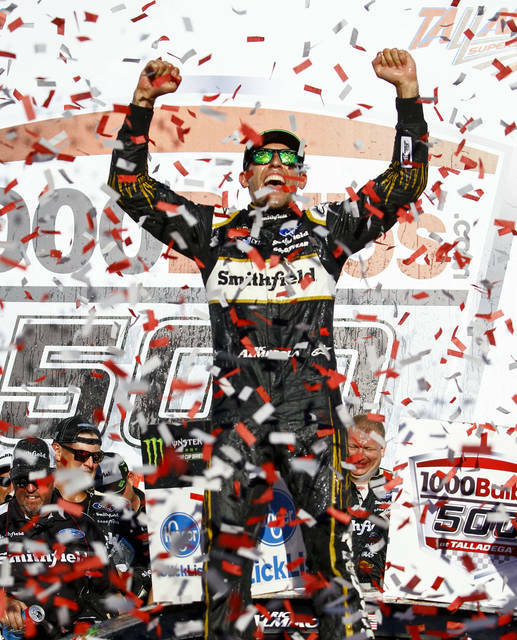 He put himself in position Sunday to cap an absolute SHR rout at Talladega with an overtime victory that earned him an automatic berth into the third round of NASCAR’s playoffs. It also snapped a 149-race losing streak for Almirola and atoned for his oh-so-close moment in the season-opening Daytona 500. 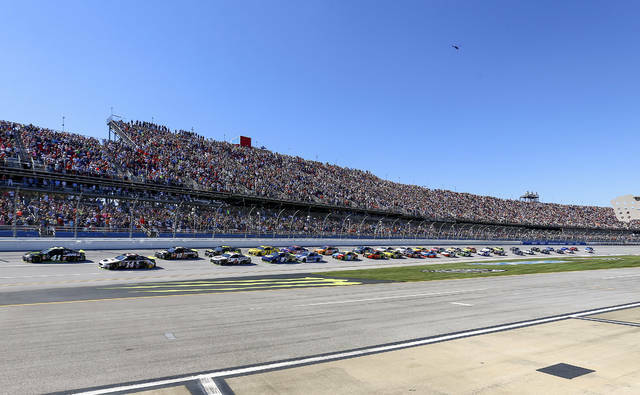 More important, it showed that SHR arrived at Talladega prepared to work as a four-car team and ensure one of its drivers made it to victory lane. The SHR Fords were untouchable all weekend. They swept qualifying, won every stage of Sunday’s race and used teamwork to pull away from the field. As the laps wound down, Kurt Busch led his three teammates in a straight line and pulled the train away from the pack, which couldn’t organize itself behind the SHR group to mount any sort of challenge. But the dynamics changed when Alex Bowman spun with three laps remaining to bring out an ill-timed caution. Now the race was going to overtime, and two of the SHR cars didn’t have enough gas for the extra laps. First Busch’s fuel light began to flicker. Then Kevin Harvick got the same warning. As the field roared to the green flag, Harvick forfeited a shot at victory by pulling off the track to get enough gas to make it to the finish. Busch stayed out as the leader with Almirola and Clint Bowyer looking for a slot to slip past him for the victory. Then Busch ran out of gas headed to the checkered flag and Almirola zipped by for his first victory of the season, first since joining SHR this year as the replacement for Danica Patrick, and first since the rain-shortened Daytona race in July 2014. It was the second Cup victory of his career. Almirola was also leading on the final lap in overtime of the season-opening Daytona 500 until he was wrecked by winner Austin Dillon. Almirola thought he had last week’s race at Dover won until a caution triggered by teammate Bowyer ruined his shot at the victory. A week later, he got his checkered flag and his stamp into the round of eight into the playoffs. “Four or five times this year I feel like we’ve had a shot to win and haven’t been able to seal the deal,” Almirola said. Bowyer finished second, congratulated his teammate and praised the SHR cooperation. Ricky Stenhouse Jr. finished third in a Ford from Roush Fenway Racing and marveled at how the SHR contingent crushed the field, even though Stenhouse had the same Roush Yates engine. SHR competition director Greg Zipadelli said the effort started after Dover when the drivers were urged to work together at Talladega as teammates. Busch faded to 14th and Harvick wound up 28th — a disappointing end because SHR was poised for a 1-2-3-4 finish before the race went to overtime. But the team understood how dominant it had been all day and fortunate it was to leave Talladega with one driver locked into the next round of the playoffs and the other three still in contention. The playoff field will be trimmed from 12 drivers to eight after next week’s race at Kansas Speedway. The four drivers in danger of elimination next week at Kansas are Brad Keselowski, his Team Penske teammate Ryan Blaney, Kyle Larson and Bowman. FUEL WOES: Keselowski was in good shape and trying to organize the pack of traffic to make a run at the SHR cars until the late caution stretched his fuel window. He ran out of gas on the final lap, fell to 27th and now can be eliminated from the playoffs. He had won three consecutive races last month to move into title contention. He felt his chance at the win, prior to running out of gas, was harmed by Bowman’s driving in the pack. Busch was steamed about two NASCAR calls late in the race. First, drivers were forced to burn fuel during a long cleanup period under caution before overtime. Then, no caution was called on the final overtime lap for a wreck in the first turn. Busch ran out of gas in the final turn. UP NEXT: The elimination race of the second round of the playoffs, at Kansas Speedway, where Kevin Harvick won in May and Martin Truex Jr. won last October. Harvick, Truex and Kyle Busch have combined to win the last five races at Kansas.